"I got this recipe from a restaurant in California 10 years ago. It's been a staple in my refrigerator ever since. It's excellent with rotisserie chicken. You can lower the calories if you stream in olive oil in replace of the mayo." Place romaine lettuce, cilantro, green onions, mayonnaise, jalapeno peppers, garlic, salt, and black pepper into a blender; blend until smooth, about 2 minutes. This herby, garlicky, tangy condiment is good on just about everything. This stuff is addicting. Thank you!! I used more mayo, left the seeds in the jalapenos, and didn't have any green onions.... You can't go wrong with this delicious sauce! AWSOME recipe ! Added about 1/8 cup of Olive oil instead of the entire 1/4 cup mayo. Taste was great! 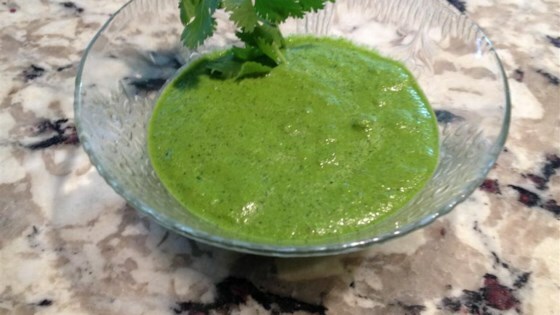 I followed the original recipe with a generous "half bunch of cilantro" and loved it! Thanks Dorothy!